Click the links in the bullets below. There is a link back to here below each topic. Cadillac Data; OBD Codes, Seville/Deville/Eldorado relay list, etc. These files are made available in hope that they will be of use or interest to you. There is no warranty of any kind, including serviceability for any purpose, and by downloading these files you agree that you will hold all entities harmless in any use of these files or the information contained therein. All files directly linked from this page are copyright © by James K Beard, all rights reserved. Please send bug and error reports to Webmaster (edit e-mail address). Existence and offering these files for download and asking for bug and error reports does not constitute or imply an offer to provide services without compensation. You may use information files here as source or reference for your own work. Please credit James K Beard and cite http:/jameskbeard.com and the file name as the source. Some material here is original unpublished copyrighted work. Please ask for permission for any other purpose, such as derivative works or teaching materials. I specifically reserve rights of first publication and discovery for original work available nowhere else, and for use of these materials for teaching and derivative works such as books, book chapters, tutorials, and publication in journals and symposium proceedings. If you ask to use this material, I quite likely may grant limited rights in writing as we negotiate, so please don't hesitate if you have a use for this material. Downloading these files constitutes your agreement to these terms. Compressed Archives: Zip, gz, bz2, 7z, LHA/LHZ, RAR, etc. My personal favorite is Bit Zipper, which integrates with Windows Explorer, does drag-and-drop addition to archives and extraction, and supports extraction of all the popular formats and creation of eleven of them, including four types of self-extracting archives. If you want to experiment to find the tightest possible compression of your file collection with just one program at about $25, this offering is hard to beat. Also includes strong encryption, file viewer for files in archives without extracting them, choice of wizard or standard windowed interface, all for one price. Bit Zipper does it all for $25 (forever license; major version updates may not be free). GUI or Wizard interface, Windows right-click-on-file access in Windows explorer, batch operation, etc. but Windows only. Offers strong encryption with passphrase protection as well as legacy weak ZIP password protection. My personal favorite; the first to support Unix/Linux archives and essentially all other archiver formats (RAR, 7Z, ISO, ZIP, ZIPX, etc.). WinZip has versions for Mac, iOS (iPhone®, iPad®), and Android. Greatest market share among archiving utilities. $30 to $85 depending on feature set. GUI based; the excellent GUI is probably why this offering holds most of the market share. The company, Nico Mac Computing (now WinZip Computing), has been around a long time; they offered WinZipPM for OS/2 1.3. SourceForge has many compressing archivers and related utilities as freeware or shareware. The free Adobe Acrobat reader can be downloaded for Windows or Mac. The full Adobe Acrobat package for Windows and Mac is a commercial software package that allows generation of PDF (portable document format) files by "printing" them and selecting a PDF converter printer driver in Windows or Mac. You can view, edit within limits, comment with bubble windows, sign, re-compress, and store PDF documents in other formats including PostScript, plain text, RTF, Microsoft Word®, JPEG, and others. Costas Arrays: This began as the CD-ROM image from the CISS-2006 paper cited on my Papers and Interests page as a 142 MB Zip archive. This original database of Costas arrays was to order 200 and included a rudimentary a data extraction utility. The database was extended to order 400 and the extraction utility improved for CISS 2008. This web site hosts a database to order 500 and a GUI data extraction utility that optionally provides polynomials that generate the output Costas arrays in a finite field, computes an idealized ambiguity function for a waveform using Costas array based frequency hop, screening for clear or sparse central 3X3 and 5X5 range-Doppler cells, screening for minimum frequency hop, etc. Links for the current files are followed by links for files from CISS 2006 and CISS 2008. The current database contains orders to 1030 and is on IEEE DataPort at DOI 10.21227/H21P42. Click the link for the GUI extraction utility version 3.2 (March 2019) (version 3.1 HERE, 3.0 HERE, 2.1 HERE). These databases are generated by J. K. Beard's utility and supplemented by searches over orders through 27 (one new Costas array found), 28 and 29. For special runs of the Costas array generator, or to suggest runs for a specific order or larger databases, please contact Dr. Beard. This Costas array database and extraction/analysis utility is licensed under a Creative Commons Attribution 4.0 International License. For the extraction utilities, the database must be of the form of a host directory which contains two directories, "Generated" and "Searches" which contain the database files. 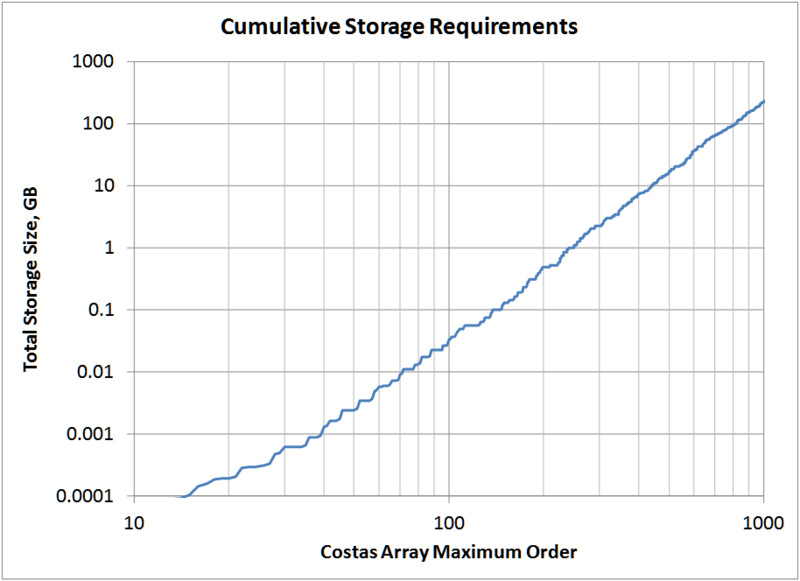 We have broken up the database by orders of Costas arrays to provide manageable file sizes. The first file is the data extraction utility, and the second file is a set of files useful in working with the database. Sizes in the form (packed/unpacked), are given for large files. For starters, you can download the new GUI data extraction utility and the "Orders three through 100" files quickly and anonymously here, or both as a single ZIP archive as the "starter pack" on the IEEE DataPort page. 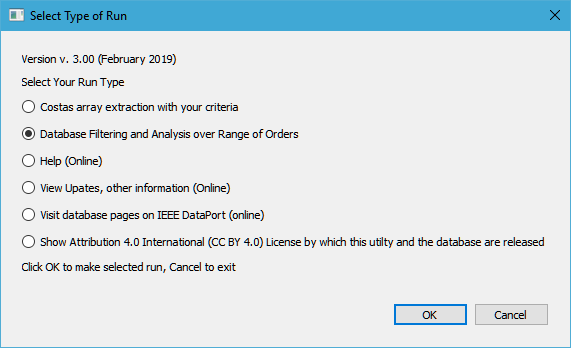 Instructions on how to use this utility as a detailed report, in pdf, is HERE or on the IEEE DataPort site as Instructions on use of the database. James K Beard, "Costas arrays and enumeration to order 1030", IEEE Dataport, 2017. [Online]. Available: http://dx.doi.org/10.21227/H21P42. Accessed: <date of your access>. Local files to order 500 may not download because of file-limiting policies/automation by web hosting. For files over 100 MB, use IEEE DataPort; if that is not an option for you, then you may need to ask for another way to get them. Please note that I may take these down in favor of access through IEEE DataPort. The Costas array extraction dialogue provides selection of database and indexing of output Costas arrays either from 0 to N-1 or from 1 to N. In addition to selecting the order of the Costas array, you specify if you want only Welch 1, Golomb 2, or any of the nineteen generator variations supported by the generator program; this data does not exist for searched databases. Separately, you can select output only of only the essential set (just one of each set of 4 or 8 congruent Costas arrays), symmetrical, or glide-symmetrical Costas arrays. You can also screen by the number of ones in the central square of the discrete ambiguity function (DAF), either 3X3 or 5X5 - or, allow the maximum of 4 or 16, respectively. New with this release, you can also specify a rectangle anywhere on the DAF. You can also screen by minimum frequency hop for each order, either within the Costas array or end-around. You can have a CSV file of the DAF that you can use with spreadsheets or other programs to plot the DAF or work with it however you choose. An esoteric option is to compute a polynomial fit to the vector of Galois field elements to the power of the Costas array, output as a vector of powers of a primitive element of the Galois field; for Lempel or Golomb Costas arrays, only two coefficients of this polynomial are nonzero. You must specify the order of the Galois field, which must be at least two greater than the order of the Costas array. The program will find the next higher value that provides an order for a Galois field, i.e. a prime or power of a prime. 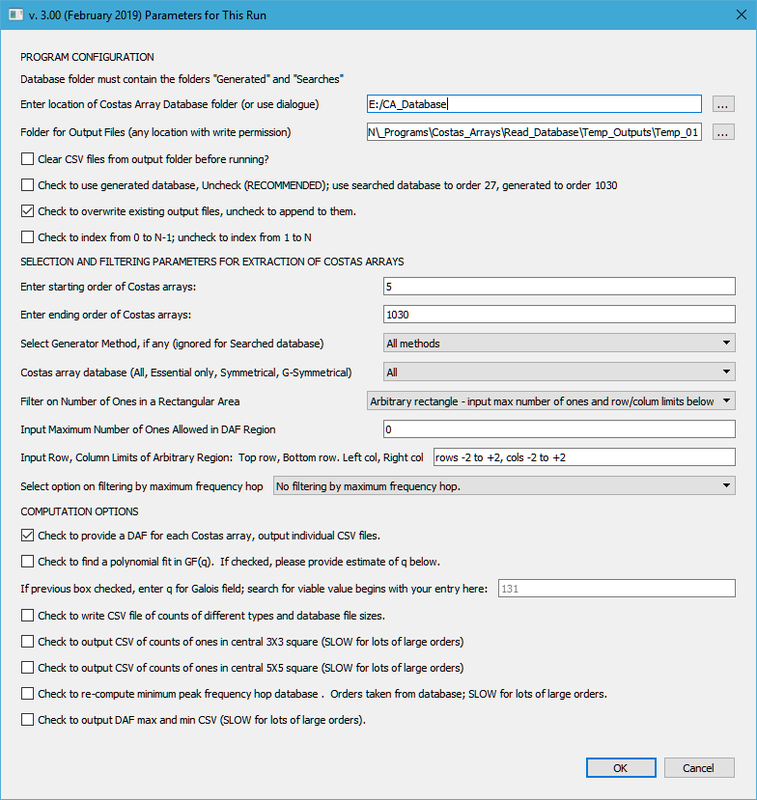 The dialog for the database analysis mode is similar, except that a starting and ending order are used, and several database analysis options are added. If you need something and don't see it there, ask, and I may be able to add it. For those who downloaded databases before orders 27 and 28 were searched, the files for the Searches folders are included in a ZIP file. A Windows 64-bit build is used for the new GUI data extraction utility because some database files exceed the 2 GB or 4 GB file size limit for 32-bit applications to "see" them properly. If anyone needs a 32-bit build, please let me know. NOTICE: I have recently found that my hosting service may be resetting the server after about 100 MB. If you are having a problem with truncated downloads, get them from IEEE DataPort, http://dx.doi.org/10.21227/H21P42. For higher orders please contact the webmaster. Data for orders up to 1030 is available now; you may request other orders. Files from CISS 2006 and 2008 are listed below, with links. Orders to 1030 are available. Storage requirements versus order is shown below. In the plot, 1 GB is 1,000,000,000 bytes. All orders to 1030 take up about 250 GB. Probability Density Functions: Executables, source code, and test file results. This zip archive includes a console utility that includes inverse probability distribution functions so you can input confidence levels and get threshold settings. Includes Gaussian, chi-square, Student’s t, F-distribution, and more. BinHex: A Windows utility that provides hexadecimal listings of any file, with an ASCII column on the right. A reverse utility that generates binary files from a hexadecimal listing is also included. File Splitter: Need to break up a file for e-mail, floppies, or multiple pass with flash hard drive, or even multiple CD-ROMs or even DVDs? This will do it, and also you get a batch file to reassemble the original file and clean up; the batch file that reassembles your large file runs under Windows, DOS, or OS/2. A Linux version that generates a bash script is TBA. Quaternions: A 2.5 MB PDF file that shows how to use quaternions to model rotation of rigid bodies, including dynamic six degrees-of-freedom modeling. A Mathcad 14 version that also loads in Mathcad 15 is here. Many errors occur when loaded by PTC versions because of a change in the way that subscripts are entered; a mcdx version would require a complete re-write and is not contemplated. An old report dating from about 1987, written in Word Perfect 4.2, Engineering Applications of Quaternions is referred to as "EAOQ" in the Mathcad file, which was originally written from that report. I have found the file and can load it in a version of Word Perfect from this Century, but the hot links for the TOC and Index don't track properly. I'll post it as a PDF file when I get a presentable output. I plan to do the animations in Maple (TM) when I need them for a new application. There is a presentation dated February 21, 2017, that updates and summarizes much of this material here. At that presentation, among the questions was a request for a computational package for quaternions. So I put that on my to-do list for a file here. The file will be Fortran 95+ code and a binary under the BSD license. BJT v-i curves: A utility that produces v-i curves for bipolar junction transistors. Fortran 95 source code included. The program is principally a Fortran 95 module that includes a callable function that computes collector current as a function of collector voltage and base current. The model is very simple and assumes that the transistor is characterized by the beta, the Early voltage (where all the collector current lines intersect) in the constant current region, a constant low resistance in saturation, and a collector leakage current for zero base current. The transition between saturation and the constant current region is modeled as abrupt. Drain conductance as a function of drain voltage and gate voltage. The model is very simple, and assumes that the transistor is characterized by the threshold voltage, the conductance parameter, and the Early voltage in the constant current region. These PDF files are updated from a four-day short course prepared from multiple sources -- primarily author-generated -- in 1999 for presentation to the South Korean Air Force. Please contact me to negotiate A fresh, up-to-date short course which can be tailored to your requirements and presented at your facility. Other topics are also available, including radar or tracker requirements and he System Engineering Process. Contact me through e-mail on slides or here. FIR Filter Design (Release Candidate 2): Design high pass or low pass FIR filters, including dedicated decimation/interpolation filters, leaving one of four overall parameters blank (number of weights, stopband attenuation, passband ripple, or transition width) and the program will find the missing parameter, or define as many bands as you like and see what the design produces as passband ripple and stopband attenuation. The Parks & McClellan FIR filter design engine is used. Output files include CSV files for the weights, the frequency response, and the weights truncated to a user-specified number of bits. Program ends with a plot of frequency response suitable for export as a PNG file for use in reports and e-mail. A log file is also written for use in bug reports. Reference: T.W. Parks and J.H. McClellan, A Program for the design of Linear Phase Finite Impulse Response Digital Filters, IEEE Trans. on Audio and Electroacoustics, AU-21, No. 3, pp 195-199, Aug. 1972. ReadMe File (665 KB PDF) NEW ReadMe file with instructions, technical data. Includes a section on how to use FIR filters in digital quadrature demodulation. Double precision application that is capable of designing large FIR filters and rounding filter weights to word lengths up to 48 bits. Output of CSV files for filter weights, weights rounded to a user-specified word length with digital filter implementation data and information, computed frequency response table, and console plots of frequency response with exports to PNG format for use in papers, reports and e-mails; sample below. On user option, you give all but one of number of weights, passband ripple, stopband attenuation, or transition width, and the program will find the omitted parameter. 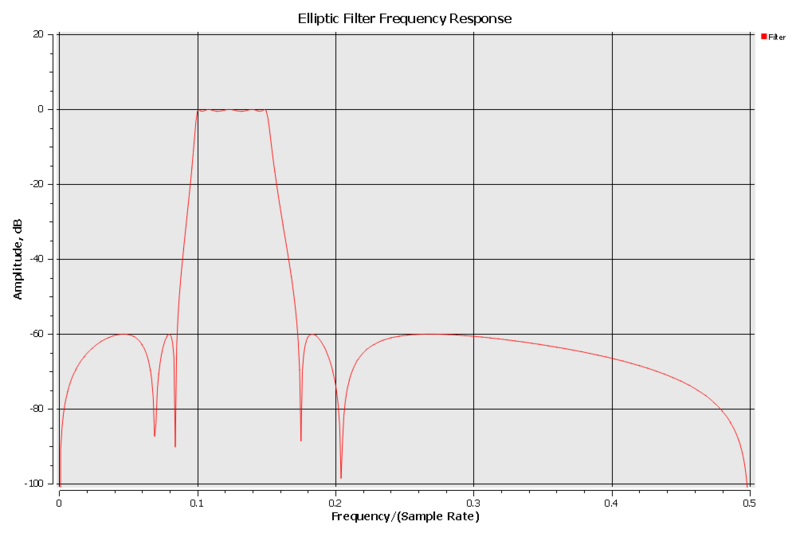 Option to find FIR filters for equalizers that have a user-defined frequency response, with example. Option to define a FIR decimation filter. Report bugs with adequate description of user inputs and all program outputs from a run that produces the error, in a single ZIP archive, to webmaster. Click on figure to view the full-size PNG file in a new browser tab. Qt DLLs to be placed in the same folder as the IIR_Design.exe file if you don't have Qt installed on your computer. NOTE: Recompiled 2016-10-09 with Qt 5. The ReadMe.pdf file contains three examples, with graphics. A new feature of this program is that it produces z-plane pole-zero diagrams of the filter designs. The inherent nature of the problem makes overflow a problem for large-order filters. I have a software floating point package that has 16-bit or, if necessary, 32-bit exponents that will take away this problem. If anyone wants high-order filters and is having overflow problems, let me know; I can have it up in a day or so but I might not get around to that for some time unless I know of a need for it. Note that the principal advantages of this type of filer - low latency, simplicity, high performance - are best leveraged through low and medium order filters, with ten to 30 zeros and as few poles as possible for a given set of requirements - is well supported by the double precision program already in place. There are two ZIP files here: the binary for a Windows 64-bit executable that computes and displays two-dimensional Taylor and Bayliss window weightings, and analyzes the results by computing the beam patterns from a circular aperture selected from a square grid of omnidirectional elements. No source code is provided. One option for the use of this program produces binary INI files for the second program. The second program is provided only as source code for a Fortran 2003 module that contains procedures for computing Taylor and Bayliss weightings. It uses binary INI files computed by the first program. This source code is provided without warranty under the FreeBSD license. Second program, provided as Fortran 2003 source code only, that provides Taylor or Bayliss weightings for your program. This program uses binary INI files produced by the first program. The ZIP file for the first program includes Qt DLLS, which are provided under the FreeBSD license, and also binary INI files for the default sidelobe levels used in the analysis. 2016-10-12 recompiled with Qt 5, license is now FreeBSD. CSV file with all filter specifications and design outputs for use with MATLAB, MAPLE, MATHEMATICA, Fortran, C/C++, etc. Originally, this algorithm was published in December 1976 as Augustine H. Gray and John D. Markel, A Computer Program for Designing Digital Elliptic Filters, Proc. ASSP V24 No 6 pp 529-38. DOI 10.1109/TASSP.1976.1162868. 2016-07-06, added BSD license/disclaimer text to GUI. 2016-07-07, fixed loop on "Cancel," added check box to allow legacy command-line interface, added menu and hot-key ALT-R to make additional runs, minor bug fix in GUI error checking. 2016-10-09, recompiled with Qt 5. Windows32 Executable with four Qt DLLs (needed because the GUI uses Qt), in a 7.2 MB ZIP archive. Put the DLLs in the same folder as the EXE file. If you have Qt 5 and DLLs of the same names installed through the OS or environment, you can omit these. Output files for six check cases, five of which come from the original Gray & Markel paper, in a 135KB ZIP archive. 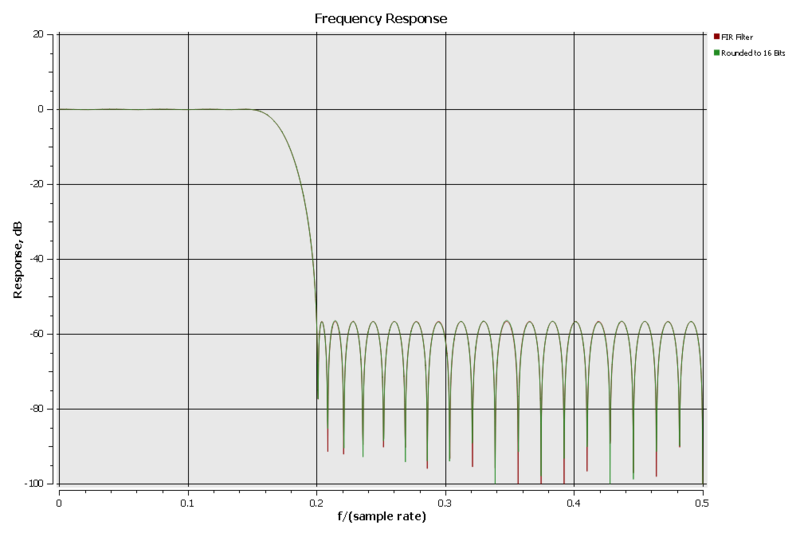 Frequency response plots are included. The printer-plot impulse responses are not included in this sample. For the text file for this design in a new window, CLICK HERE. Dolph-Chebychev and other Chebychev filters. Short white paper on the use of decimation filters for sampling at I.F. and performing a digital quadrature demodulation, updated and refocused from Beard, J. K., Optimization of Discrete Signal Processors using Array Processor and CCD Technology, IEEE ICASSP, April 1979. NOTICE: About 1969 I was shown an article in an IEEE journal, I believe the Transactions on Speech and Signal Processing (now Acoustics, Speech and Signal Processing) that showed a recursive lattice implementation of IIR digital filters, as opposed to the classical double-feedback, double-feedforward data flow diagram for each pair of complex poles and complex zeros. I am now unable to locate this article. Anyone aware of this reference, please notify me, the webmaster. Photography Presentations: In February and March of 2003, I gave two presentations on photography. Part II: Color, contrast and the Zone System, lens design and trade-offs, digital and conventional photography, and scanners. Cadillac Northstar exhaust sounds with turbo mufflers replacing stock mufflers. Short version of Cadillac Northstar exhaust sounds with turbo mufflers replacing stock mufflers. Eldorado relays for the 2001 model year, probably good for all E/K platforms, from Caddyinfo user WarrenJ, with minor mods; a Microsoft® Excel™ 1997-2003 file. Seville and Deville parts for the same model years will differ slightly. GM SI Document 641058, October 1999 torque-and-twist head bolt tightening specification change for 1993-1999 Northstars. A plain text file. Always use the specifications that come with new head bolts because torque-and-twist specifications are updated every few years. GM Bulletin #02-06-01-009C, Higher Than Expected Oil Consumption (Clean Piston Rings) - (Oct 23, 2003).